Just as much you are busy with work and other stuff, consider spending some quality time with your baby. I am not talking about playing in the court yard or garden in front of your home. I am talking about going out and catching some real fun outside. Facts said that hiking is one of the best ways to relieve parental stress. Many people look for different ways to spend time with their toddlers, but they just end up doing it the common ways. Have you tried hiking with your toddler? This article stands to enlighten parents- mother and father, on one of the best ways to gain experience and fun with their toddlers. Let us dive in! Hiking is one of the best ways to blow off some steam with your family. Probably, your wife has been complaining of not spending quality time with your kids or maybe she needs some time for herself to rest. Hiking is perfectly fitted for the job. Before hiking with your toddler, you must consider some paramount things. Firstly, consider indulging in a tangible and thorough preparation before thinking of taking your baby on a hike. Is road palatable? Weather? Where are you going? How do you feed or rest? So many other questions that need answers before embarking on this journey. We cannot neglect these things because of the fun and experience waiting for us. Plan where to stop and rest for lunch break or snacks. You do not want to have an unhappy child throughout the hiking, you might even go back home halfway. Sometimes back, I took my last born out for a walk, just a walk! I forgot to take his favorite toy- Mr. Squishes, and he kept on crying until I decided we should go back to get it. Secondly, try to test run wherever you are going hiking without your child. Check for the best trail whether it is a trail close to restrooms and public bathrooms and so on. Choose a trail that fits you very well! When can you start hiking with a toddler? Another set of things you should consider is time. What time is suitable to start hiking with your toddler? That question is a bit ambiguous. I could mean the age from which you can start hiking with your toddler or I could also mean the time of departure. Well, we will touch the two perspectives, as they are equally essential. Well, considering the age, it is advisable not to take babies which cannot sit on their back on hiking. Newborn babies less than a month. Usually between 6 months and 14 months. Taking babies of this age comes with a lot of disadvantages such as constant wetting of diaper, crying, cranky behavior and so on. On the other hand, the second category is the time of departure. Whenever you are taking your baby on hiking, it is advisable to go early in the morning when you are still active. The muscles are still strong and unused. Get ready to move at most by 9 am and be back at noon for lunch or siesta. How do you make hiking fun for kids? Hiking normally might not be enjoyable for kids growing up. They prefer to play with their bicycle, toys, video games and many other kinds of stuff they engage nowadays. They would most definitely not have much fun while on a hike since it is a strenuous activity. You have to spice it a bit with some stuff that would make it fun and enjoyable. I have a few tips that you can explore. The first thing on my list is going in groups with other people with kids like you. Yeah, kids catch more fun when they meet new kids about their age whether male or female. The second thing is giving your kid a camera. Well, I heard some friends saying that getting your kid a camera would make the trip interesting for him/her. With a small camera, your kid gets to explore the environment by taking some pictures. Mind you, this is solely dependent on the kid’s age. Let’s go back to talking about toddlers. Get your kid adventurous costumes like a hat and walking stick. You can even put on matching costumes. This would make it fun, “like father, like son”. 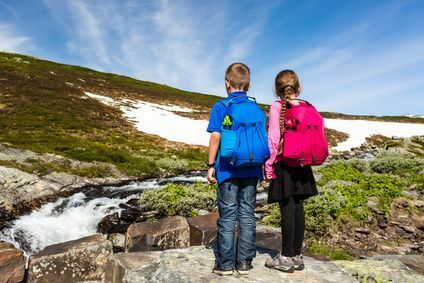 What to bring hiking with kids? This is somewhat part of your preparation. You need to know what to take along when hiking with your kid. Bring along snacks, drinking water, extra underwear, backpack, screen repellent, bug repellent, stockings, drinks, the right clothes, mat. Well, you don’t want to carry many loads while going on a hike. How many miles can a child walk in a day? It depends solely on the age of the child. You can either carry, push, hold or allow walking on his own. The number of miles you can walk with your child would depend on your stamina. How do you carry your toddler? For kids that cannot walk, you have to carry them all along. You can use a back carrier or front carrier. The front carrier is suitable for babies between 1-5 months to support their head and neck. The back carrier is suitable for children that can sit on their back between 6-14 months. Men tend to carry most of the load when going on a family outing. I would advise you to reduce the amount of load. Just looking out for you though! Hiking with your 3-year-old baby shouldn’t be a hard thing to do. It is necessary and important to spend some time with your baby. Experience, explore and appreciate nature by choosing the right trail for your hike. We have discussed above on how to hike with your toddler. Things you should and things you should avoid. As long as you follow these guidelines listed based experience, you are good to go!